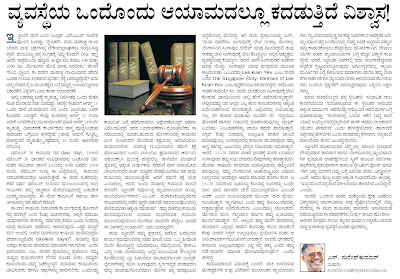 This is an article published in Vijaykarnataka today. Would you please mind commenting on this? As a minister who believes in strengthening of demcocracy and a able administrator, you should push for the Election of the mayor by people and also the empowerment of Ward committess under the 'Bangalore governanace Bill'....BJP should contest the BBMP elelctions based on your performance and BJPs commitment to GOVERNANACE. I understand its tough for you since local MLAs and MINISTER'S support is critical,but SIR you as a URBAN development MINISTER should not leave any oppurtunity to bring in accounatablity and transparency in governance.